It’s often a moment of joy when babies start making their way around their little surroundings. But let’s face it, this is also a moment that calls for great caution on the part of the parent. For instance, you want to restrict the baby from entering dangerous situations over and over again. Well, baby indoor safety gates are the answer to that. In fact, these gates have almost become a necessity in homes with crawling babies. But the big question is, what’s the best indoor safety gates out there? Well, there’s an overwhelming number of baby gates out there. Unfortunately, not all of them perform as advertised. We’ve taken time to research and test a number of models. Below is a narrowed down list and review of the top 10 best indoor safety gates worth putting into consideration. 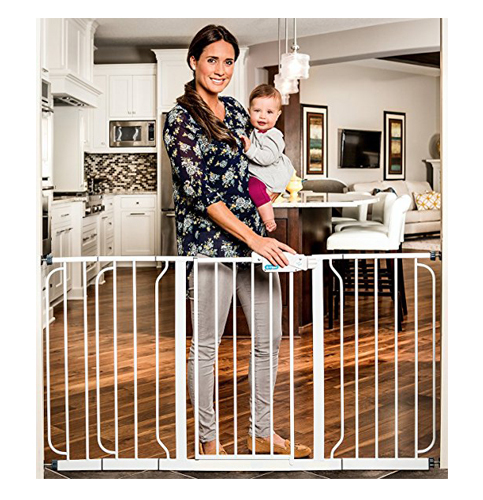 This standard width safety gate offers a little extra height to keep your kids inside. It stands 23 inches tall and can be adjusted to fit openings that measure 26-42 inches wide. Pressure-mount mechanism offers easy and secure custom fit. This mounting system uses rubber bumpers to protect your wall from scratches. The locking bar is notched and marked to give an easy time during installation and re-installation. Assembly process is totally tool-free. This indoor gate is made of wood to add a natural touch to your space. 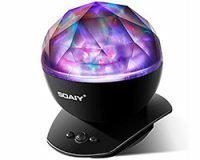 It’s available in 4 different colors and has a neutral style that matches a variety of home decors. Want a safety gate that’s super wide yet portable? Well, this expandable 28-inch gate might just be what you’re looking for. It fits openings up to 192 inches and is made of eight 24-inch panels. The panels are removable and can be customized into a variety of shapes. For instance, they can be configured to create 19 square feet of play area suitable for kids who are 6 to 24 months old. There’s a safety lock release lever with a one-touch mechanism for added convenience. This is a double-lock system enough for adults to pass through. The gate is made of steel for ultimate durability. It provides the convenience of a foldable design that saves storage space and makes setup a breeze. This gate gives you the height you need for maximum protection. It stands 41 inches tall and can be adjusted for openings from 29-37.5 inches wide. The extra few inches are achieved via a 6-inch extension kit included in the package. Setup is by a simple, damage-free pressure mount mechanism. There’s a one-touch release safety lock for added security. The gate has a walk-through door for hassle-free entry and exit. A steel construction offers a durability you can rely on. This extra-tall gate is suitable for pets and children from 6 to 36 months old. Get some extra inches with 2 extension kits that come with this baby gate. There’s a 6-inch wide extension kit and a 12-inch wide extension kit. 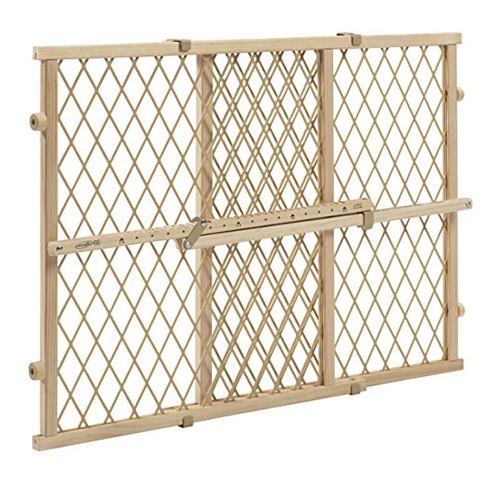 Fitted together, you get an expandable baby gate that fits openings from 29-50 inches wide. 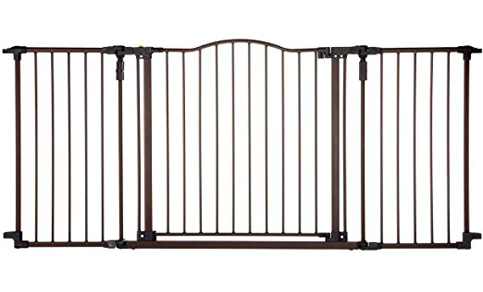 The gate stands 30 inches tall and mounts easy on the wall using rubber bumpers. A one-touch release safety lock allows for simple one-hand opening. An all-metal frame makes the gate sturdy and durable. It’s recommended for 6-24 months kids and medium to large pets. This walk thru gate adds the contemporary look of steel and a natural warm touch of wood to your home decor. It’s fashioned from high-end pine wood and durable steel. This is an extra-tall gate standing at 37 inches. The width can be extended to fit openings from 29-43 inches wide. Well, the extra length comes from 4-inch and 6-inch wide extension kits. You get the convenience of a one-touch quick-release lock for one-hand operation. Installation is done via a simple pressure mount system. This indoor safety gate folds for space-saving storage and is suitable for 6 to 36 months children. Extra-wide openings that exist between rooms call for a super wide lock gate. That’s exactly what this gate is built for. It spans widths of 38.3-72 inches and stands 30 inches tall. Pivot points are included on the panels for independent movement that comes in handy when mounting on angled walls. The entire length can swing on both sides. The entrance itself is 25.5 inches wide so adults can pass through with ease. This gate is constructed of heavy duty steel and finished in bronze to match any home decor and provide long-lasting durability. This metal indoor gate comes in a neutral white finish that complements any existing decor. 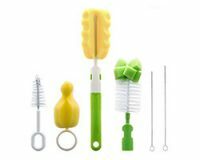 It includes three extension kits that are 6-inch, 8-inch, and 12-inch wide. With these extension kits, this indoor gate can expand to fit openings that are 29-57 inches wide. The gate is 30 inches tall and mounts on the wall using simple pressure mount rubber bumpers. There’s a safety lock feature for added security and a walk-thru door for easy entry and exit. 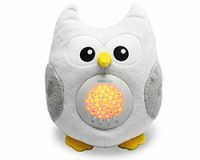 It’s a good security feature for children who are 6 months to 24 months old. A durable indoor gate with a decorative finish. Well, that’s what you get from this 5-foot gate. It’s made of oak and steel furnished in brown and black. This is a 32-inch tall gate designed for openings from 36-60 inches wide. An arched door opens on both direction for easy entry and exit. Opening and closing is a one- hand operation. The gate is pressure-mounted on the wall using tension bolts to protect the wall from damage. It’s a good recommendation for the age range of 6 months to 2 years. 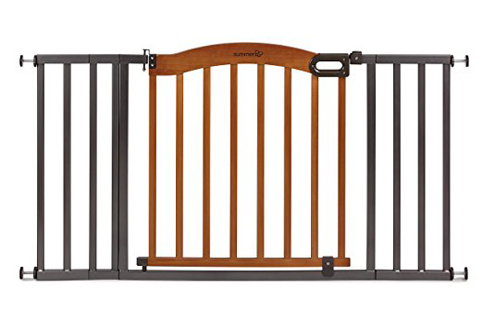 Regalo extra tall gate keeps your kids from the top and bottom of stairways. The gate extends from 34-55 inches and stands 35 inches tall. Included in the package is a wall mount kit and banister mount kit for easy installation. A stabilizing foot keeps the gate secure for increased security. One-hand operation lever adds more convenience. This gate is made of steel for increased durability. It’s suitable for kids between 6 to 36 months old. This indoor gate is built with simplicity in mind without sacrificing safety. The gate is built for openings that are 29-39 inches wide. There’s a 6-inch extension kit that gives you the extra inches. It’s 30 inches tall and uses tool-free pressure mount system to attach to walls. A walk-through door comes in handy to provide easy access. This indoor safety gate is constructed of steel for maximum durability and strength. It’s a good security feature for kids who are 6 months to 24 months old. 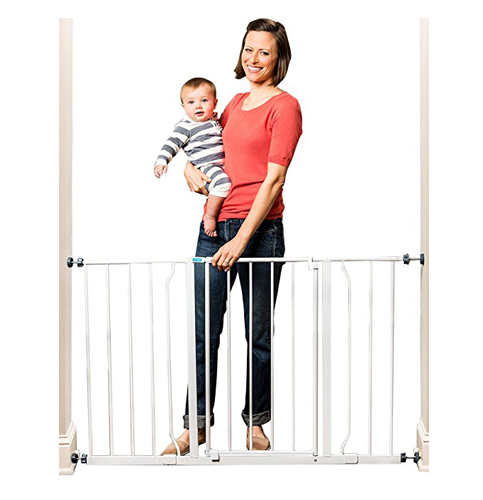 There are endless options out there for parents looking for baby gates. What matters at the end of the day, however, is to get the right safety gate that’s worth every penny spend. That said, there are a few considerations you need to keep in mind before hitting that purchase button. 1. Where is it going to be used? The planned location of a safety gate is quite important. For instance, if you plan to use on hallway or doorway, then either a hardware or pressure mounted gate can do the job. Things are a whole lot different if you plan to install the gate at the top of a staircase. I mean, this is a location that needs the safest and more robust barrier. Well, that leaves you with the one option of a hardware mounted safety gate. Baby indoor safety gates come in different widths that you need to match with the size of the opening it needs to protect. Large openings will require extra-wide gates. You can choose between a swing or step over gate for this purpose. On the other hand, small, awkward spaces will do well with a retractable gate that can be rolled up out of sight when not in use. But it’s a good thing that most manufacturers out there provide expandable gates that can be adjusted to the size of an opening. This is an important consideration in case you plan to move your gate from one room to another. Pressure gates offer the portability you need. I mean, there’s no screws or any holes to worry about. This makes them super easy to move from one place to another. Baby gates come in all shapes and sizes. Careful consideration should be made to ensure that the gate you choose is the right size for your kid’s height/age or your pet’s size. For instance, a taller child will need a taller gate for maximum security. Well, any product that has to do with child safety needs to have some standard of quality and safety. 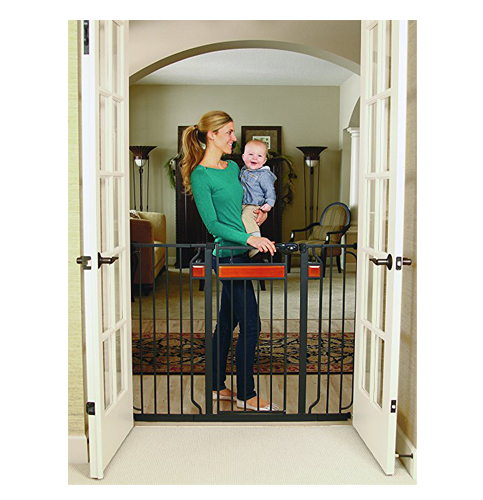 Baby indoor safety gates are no exception. Choose a gate that is safety certified, which means it’s durable, strong, reliable, and of course safe. Babies are our precious little things and giving them ultimate protection is what matters a lot. 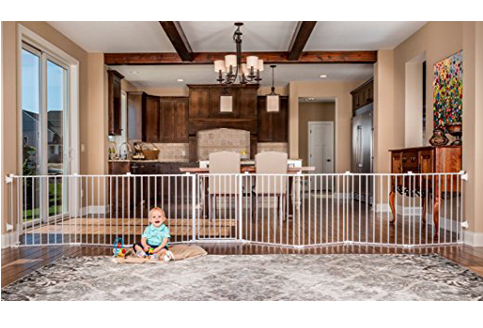 That’s exactly what you get from the above reviewed best baby indoor safety gates. Now’s the time for you to make your selection and create that child proof environment in the comfort of your home.